Whenever news stations and magazine articles cover the topic of electric vehicles (EVs), the conversation is typically centered around Tesla. The automaker seems to be perceived as the only major electric car manufacturer of note. But the truth of the matter is that most mainstream automakers are currently adding electric vehicles to their lineups, even developing electric-powered versions of their most popular models. Volkswagen: Fueled in part by the emissions testing scandal that played out in the media a couple years ago, Volkswagen is now planning on offering 50 models of fully electric vehicles by 2025, and expect to sell 2 to 3 million electric cars per year by that time. Their electric vehicle lineup will be headlined by the Volkswagen I.D. series of cars, vans, and SUVs. Base model I.D.’s will be priced at less than $30,000 and offer a range of 206 miles on a single charge, with upgraded options having ranges up to 340 miles. Hyundai: While Hyundai has dipped its toe into hybrid/EV development with the Ioniq Electric and Konda Electric, the company is now in the process of making a full-scale plunge. By 2025, Hyundai plans one of the world’s top-3 EV manufacturers, looking to offer 44 models of hybrid and electric vehicles. But even the company’s existing vehicles are quite capable, with the Kona Electric SUV having a range of nearly 260 miles, at a price a hair under $36,500. Nissan: Nissan has long been heavily invested in the development of electric vehicles. The first all-electric Nissan Leaf rolled off the manufacturing line nearly 10 years ago, which has given the automaker time to refine their approach. The 2018 model retails for less than $22,500 after tax credits, and offers the ability to get 90 miles’ worth of charge in only 30 minutes with a fast charger. Audi: For those looking to find a car that’s classy, green friendly, and powerful, German automaker Audi has been developing its electric and hybrid e-tron line since 2009. The first mass-market all-electric model is debuting in the United States in 2019. The introductory model boasts 402 horsepower, a top speed of 124 miles per hour, and a zero to 60 time of 5.7 seconds. Just about every other major car manufacturer is upping their investment into the growing electric vehicle market. However, the extent of commitment varies from company to company. American manufacturers appear to be testing demand by pushing sales of electric vehicles in China. But on the other hand, Volvo is aiming for a goal of 50% of its new cars being fully electric, while Porsche is clearly taking direct aim at Tesla’s target market, reportedly doubling the production capacity for their new all-electric Porsche Taycan after being surprised by the strength of consumer demand. Electric vehicles are clearly going to become a hot commodity in the next few years. If you’re not already driving a hybrid or plug-in electric vehicle, the odds of your next car lacking a gas cap are rapidly increasing. But how are you going to power it? Charging an electric vehicle is cheaper than fueling up at a gas station, but it’s not cheap. Understanding the cost of ‘fueling’ an electric car requires a fairly radical reframing of how you think about a car’s efficiency. Phrases like ‘fuel economy’ and ‘gas mileage’ and ‘miles per gallon’ don’t apply to electric vehicles (though they still do with hybrids). Calculating the ‘cost to charge’ an electric vehicle requires the consideration of a couple factors—how much electricity the car’s battery can hold, and how much electricity costs in your area. Bear in mind that just about every model of electric car offers larger battery options for extended driving time. But most battery capacity options are between 25 and 60 kWh. Driving range varies depending on capacity, with most EVs able to drive 150 and 250 miles on a single charge. All these variables make it challenging to estimate how much it costs to drive an electric vehicle. But here’s a middle of the road example. If you own a standard Nissan Leaf (which has a 40-kWh battery with a range of 150 miles per charge) and drive about 300 miles per week, you’ll have to charge it twice per week. This would require 80 kWh of electricity, which under PG&E’s time-of-use rates would cost anywhere from $15 to $30. This is less than you would pay at the gas pump, but it does add up over time. Why spend thousands of dollars on electricity over the life of your car when you could instead invest it into a solar power system? You could effectively drive for free, while saving tens of thousands of dollars on your energy bills. But buying a solar power system does require a bit of planning. Even if you don’t yet own an electric vehicle, you’ll want to factor the need to charge one in your solar power plan. We often assist homeowners with expanding their existing solar power systems after they have purchased an electric vehicle. However, it’s significantly more cost effective to anticipate this need, and buy your solar power system with it in mind. By planning ahead, we can account for the need to charge a vehicle when sizing out your solar power system. Even better, if you plan on purchasing an electric vehicle in the near future, we can help you pick the right vehicle charging station and install it while we’re installing your new solar panels—we often work with Clipper Creek in Auburn, but can also help with other charging stations. You should also know that PG&E offers special rate plans to electric vehicle owners, and SMUD offers a 1.5 cent per kWh credit when you charge your vehicle between midnight and 6 a.m. While charging your vehicle in the middle of the night may sound inconvenient, many vehicles allow you to set a charging schedule (as an example, Hyundai published a brief video guide for setting a charging schedule in the Ioniq Electric). 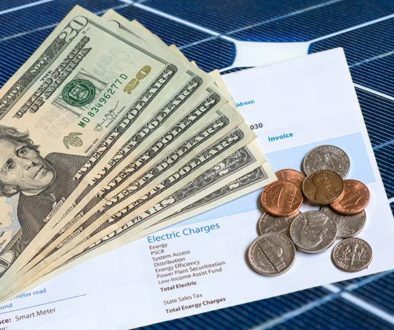 Obviously, there’s a lot to consider—whether to go solar, whether to buy an electric (or hybrid) vehicle, whether to customize your solar power system to account for vehicle charging—but Capital City Solar can help you make sense of it. Contact us today and we’ll work with you to identify whether solar is right for you, and what systems best meet your needs.